Dr. Frawley has for decades taught an integral approach to Vedic knowledge combining, Yoga, Vedanta, Ayurveda and Vedic Astrology along with the greater background Vedic studies. This includes his books like Yoga and Ayurveda, Ayurveda and the Mind, Ayurvedic Astrology, Soma in Yoga and Ayurveda and Inner Tantric Yoga. To this list, and synthesizing all related teachings, he has added the Art and Science of Vedic Counseling that he has written along with Dr. Suhas Kshirsagar, one of India’s most noted Ayurvedic doctors and teachers. The book is the first title in the West on Vedic counseling that is the background guidance approach of all Vedic sciences. 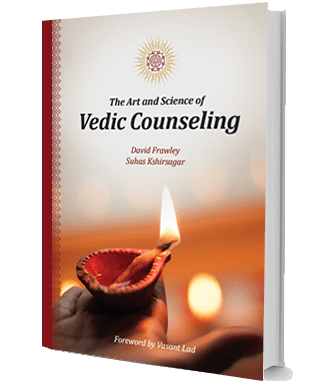 It is the basis of Dr. Frawley’s new course on Integral Vedic Counseling.